Clothing/Jewelry Description A white t-shirt and yellow shorts. Distinguishing Characteristics Hispanic male. Brown hair, brown eyes. Arrieta had a beard and mustache at the time of his disappearance. He has the following tattoos: a lady and Jesus Christ on his chest, a bare-chested woman wearing a sombero on his upper right arm, a skull on his upper left arm and a spider on his leg. Photos of Arrieta's tattoos are posted with this case summary. 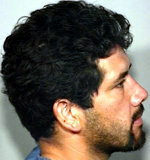 Arrieta was last seen at approximately 8:00 p.m. on October 7, 2001, leaving his residence in the vicinity of 21st Avenue and Wilshire Drive in Phoenix, Arizona. He has never been heard from again. His car, a white two-door 1994 Mercury Cougar with the Arizona license plate number NJL509, was located abandoned on October 11 in the area of 18th Street and Washington Street. There was no sign of Arrieta at the scene. Foul play is suspected in his disappearance. Updated 3 times since October 12, 2004. Last updated September 24, 2012; three pictures and alternate height and weight added, distinguishing characteristics updated.